All Roads Lead to the Bloomington Antique Mall! More than 120 booths with a wide variety of antiques, collectibles and unique items provided by merchants from across the U.S. We can help you furnish, decorate, or accent one room or an entire home, office or business. 50 beautiful new lighted glass cases filled with coins, jewelry, and other smaller-sized items of every description. Shop our Customer Appreciation Weekend Events! And be sure to visit our sister facility, the Exit 76 Antique Mall in Edinburgh, Indiana. It is conveniently located just 10 miles north of Columbus, Indiana and 30 miles south of Indianapolis. It's a one-level, climate-controlled, 72,000-square-foot facility, featuring 600 booths & lighted cases, with over 360 merchants from across the U.S.
Take a look at this great article in Bloom Magazine! The Antique Mall is back and better! See what February's Bloom Magazine has to say about the Bloomington Antique Mall and its offerings! Check it out! Columbus, Indiana was recently ranked as one of the most affordable places to retire - and our sister mall in Edinburgh was mentioned in the article! The Exit 76 Antique Mall has recently received national recognition by the AARP and Apartment Therapy Magazine, and was also mentioned in an article on Indy's WISH-TV! Located on I-65 at the 76B exit, the mall features 600 booths and lighted cases, full of everything from antiques and collectible to modern artisan creations. Be sure to stop by when you're in the area, it is truly a collector's dream! Articles have also appeared on Wave3.com, MSNBC, USA Today, LiveAuctioneers.com, WIBC 93.1 (Indianapolis), and numerous web archives. And don't miss the great full-length feature article in Antique Week Magazine! We are pleased to announce that the Original "Kramer's Best" Wood Improver and Antique Furniture Restorer is now available for retail sale at the Bloomington Antique Mall. The Green Vest Team is available to assist you with carrying and loading your purchases. 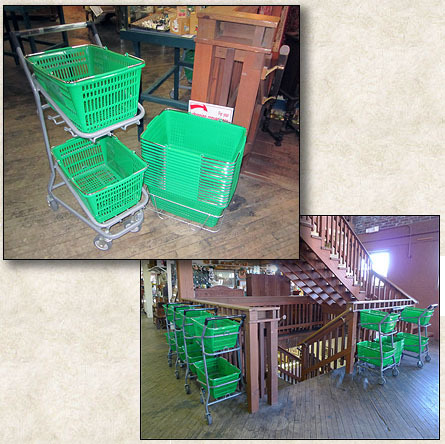 Our baskets and carts are eagerly awaiting your items! 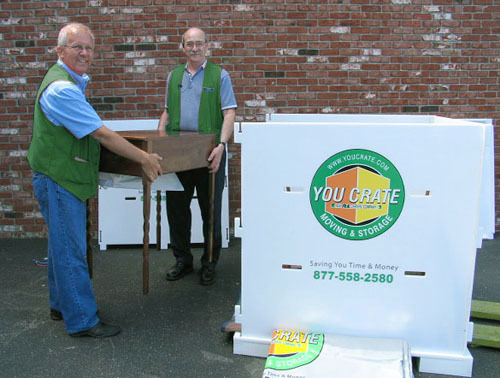 We can package and ship your purchase anywhere, using the You Crate system! Shipping by UPS is also available. Be sure to watch this space for breaking news!